This is The Art of Sara Lea, the website containing the art of Sara Lea Schneider. 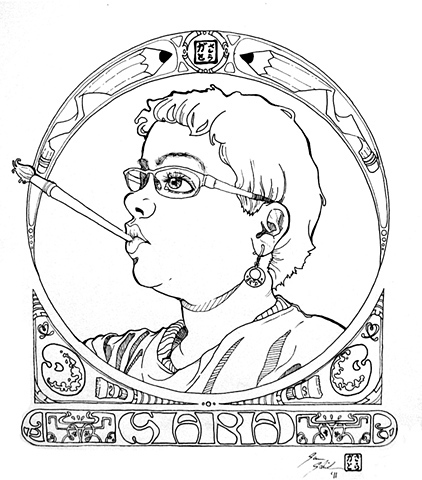 Sara is a traditional artist in her twenties who works from home with her four cats in Baton Rouge, Louisiana, USA. Her ultimate influence is Art Nouveau, specifically by the artist Alphonse Maria Mucha, and her preferred mediums are ink and colored pencils. Her favorite subjects are women. She hopes to one day illustrate books and is in collaboration currently to write and illustrate a children's book. Sara as well hopes to create her own webcomic entitled "Card Game", which is still currently in the scripting phase.